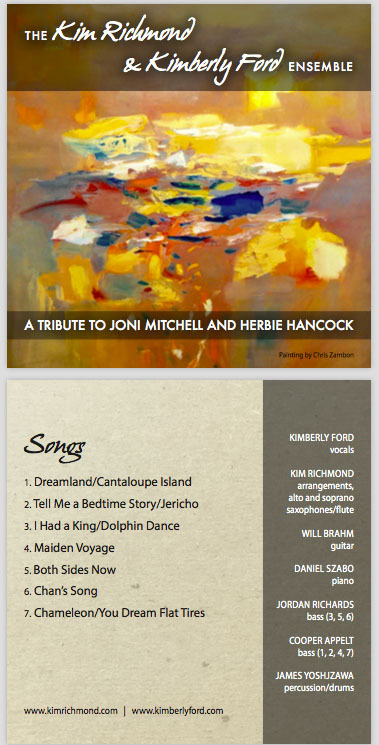 Jazz singer Kimberly Ford captures the vocal inflections and range of Joni Mitchell reminiscent of her early years, as well as powering skillfully through the sultry, deeply jazz influenced compositions from her later collaborations with jazz bassist Charles Mingus and pianist Herbie Hancock. Saxophonist Kim Richmond, a multi Grammy award nominee not only soars through these masterful reinventions on saxophone and flute, but has orchestrated them with exquisite texture and sensitivity. The music is a reflection of the real life bond between these two great artists, Joni Mitchell and Herbie Hancock. The audience immediately feels the deep musical connection they share. 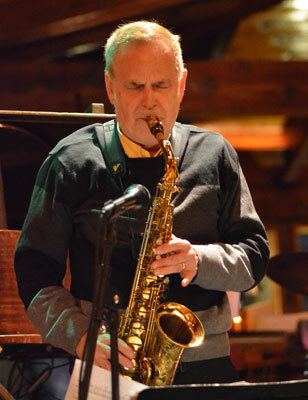 Kim Richmond has been a member of the orchestras of Stan Kenton, Louis Bellson, Bob Florence and Bill Holman among others. He also leads the L.A. based, Kim Richmond Concert Jazz Orchestra. 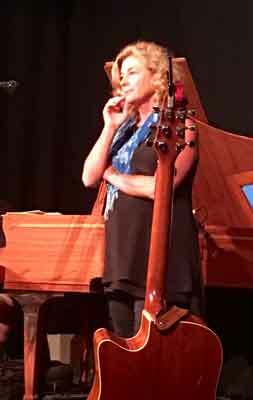 Kim has instructed at such distinguish Jazz programs as the University of Southern California Jazz Studies Department and The California Arts Institute as well as being a member of the faculty at numerous Jazz camps both nationally and internationally. Kim has a total of 10 recordings under his own name and has been a sideman on numerous others. Kimberly Ford has been featured at Jazz Festivals throughout the US including the Coleman Hawkins Jazz Festival and has toured the US, Ireland and Canada with her music. She is on the faculty of two California based Jazz studies programs. Kimberly has produced two albums of her work; Songs in the Key Of Sea and Table For One. She has been a featured vocalist on both Television and film.